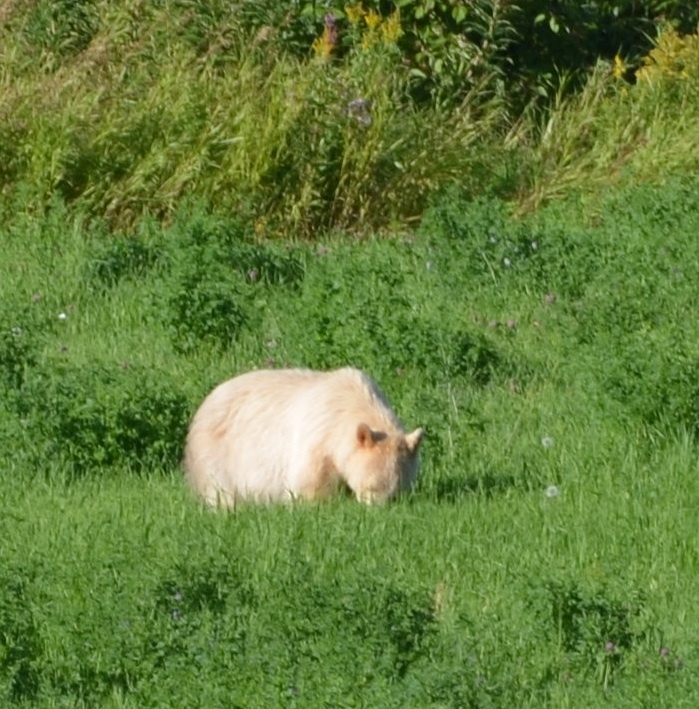 A Kermode Bear is known by the Aboriginal People of the Pacific North West as ‘The Spirit Bear ‘or ‘Ghost Bear’. this sub-species of the Black Bear lives only on and near Canada’s Pacific Northwest Coast. This rare animal is found on some of the larger remote islands of the North Coast and along the Skeena River which flows through the city of Terrace before entering the Pacific Ocean 140km to the west near Prince Rupert. Now a days the sighting of a Kermode bear is something that is very special and is an event that many wish for themselves. 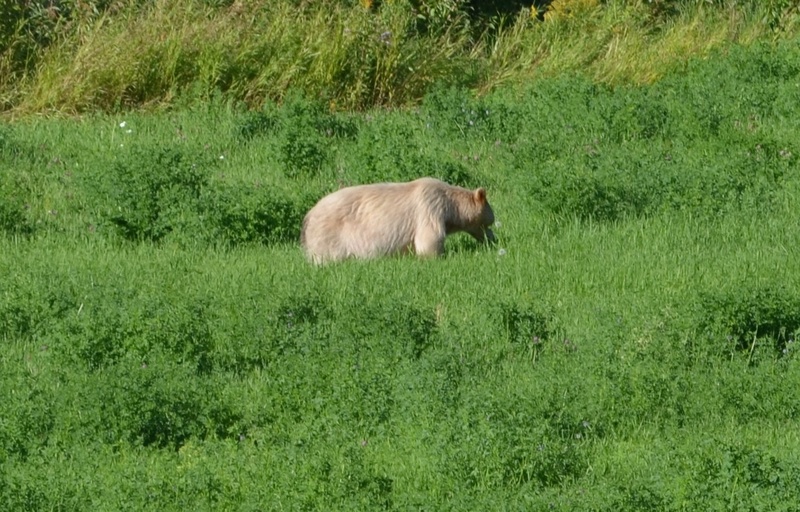 Black Bear and Grizzly show up more often in this and other areas. 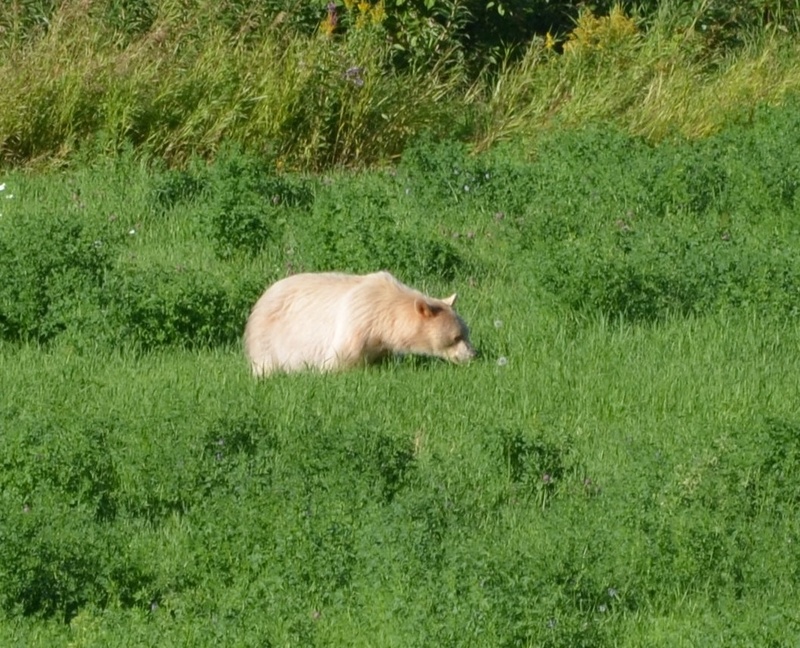 Kermode bear has a white thick fur. 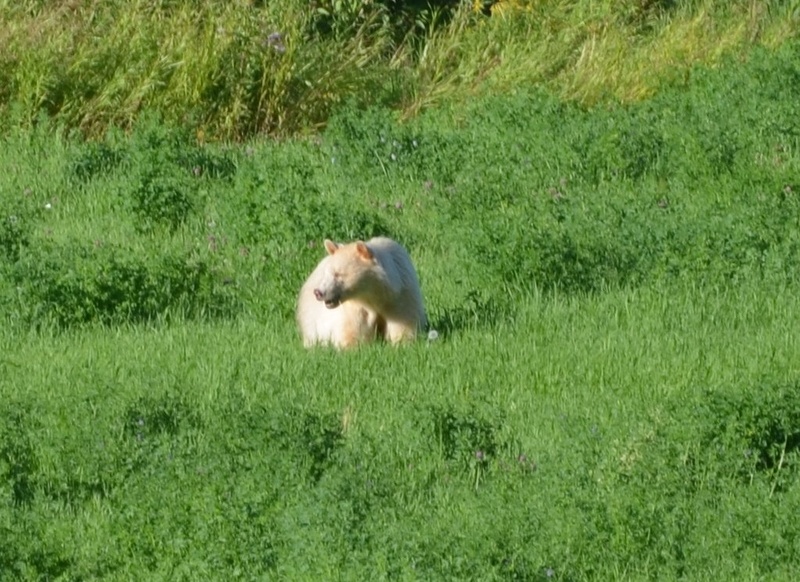 It is no an albino it is a true white bear. 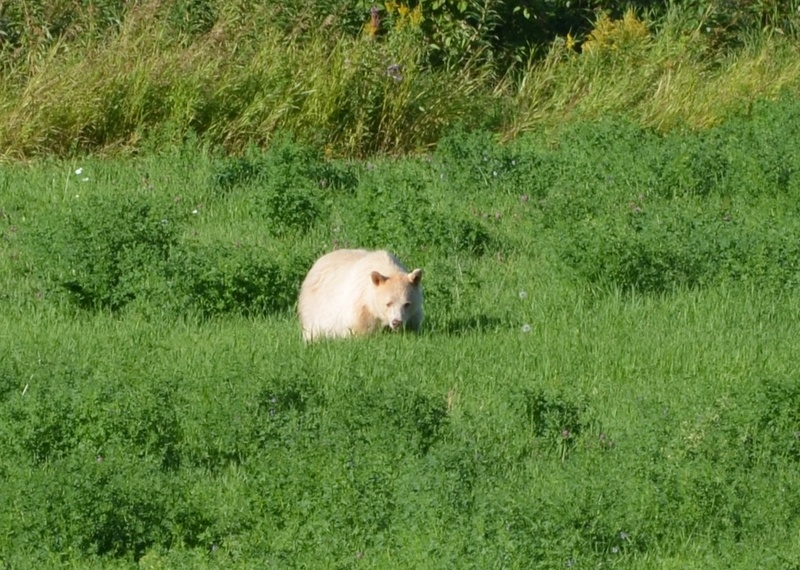 In the middle in August as we drove along the Skeena River Valley area we saw something white moving faraway. We stopped the car to check it out. 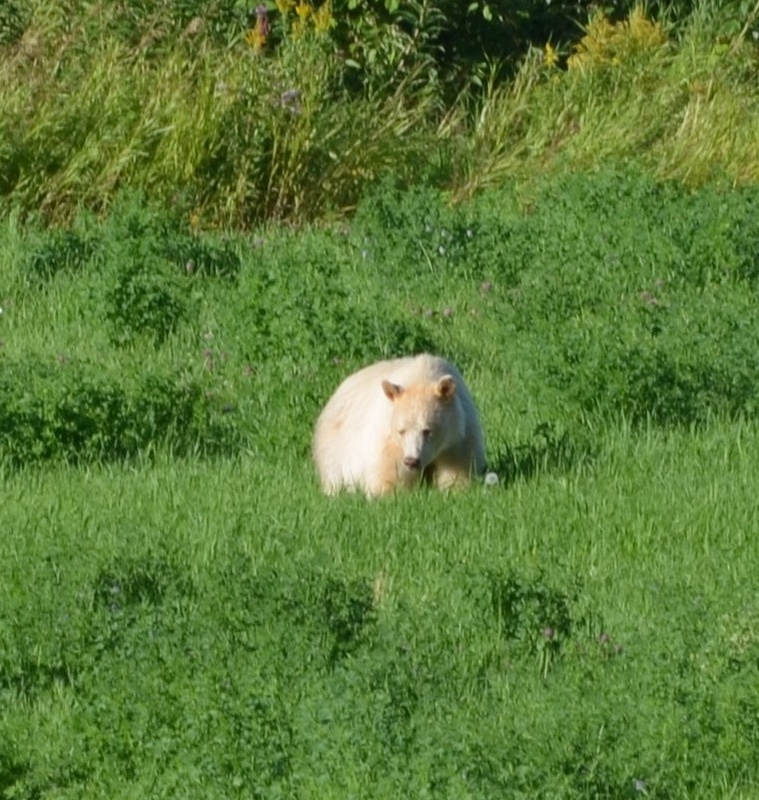 By now we are pretty much sure this is a rarely seen bear. 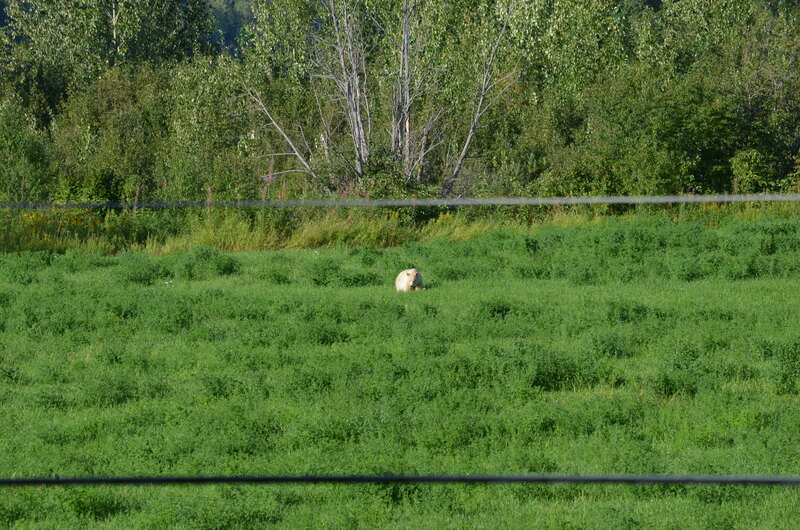 (estimates vary between 400 and 1000) The large white body in middle of the big green grass seemed to enjoy eating plants and moved slowly. 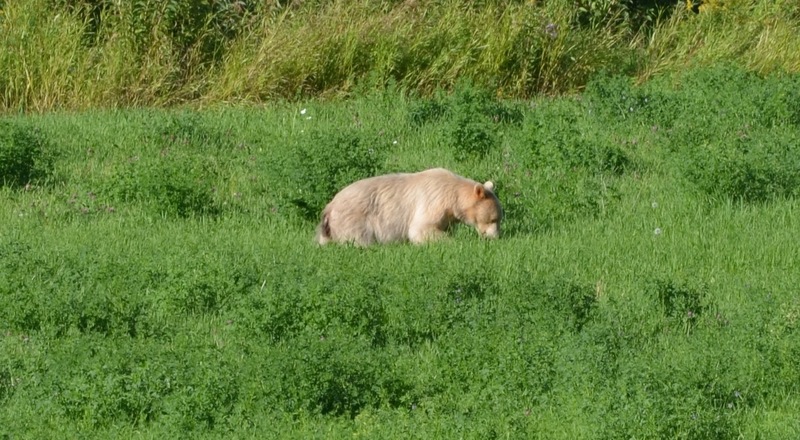 This Kermode that we saw it could be a male bear since it is without any cub and big body. Females are much smaller. We can guess for the weight this one should be more than 200 kg. as from the information that a male bear weight can reach up to 290 kg. Some people never have a chance to see the real one but it is often depicted in picture and statues around the city. Using zoom lens to get some impressive move of the beautiful bear, we watch it for a while because we never know when will this pretty bear will show up again. Scientists know how black bears are born white. They’re just not sure why. The phenomenon, known as Kermodism, is triggered by a recessive mutation at the MC1R gene, the same gene associated with red hair and fair skin in humans. To be born white, a bear must inherit the mutation from both parents. The parents themselves don’t have to be white. They just need to carry the recessive mutation. So it’s not uncommon for white bears to be born to black parents. 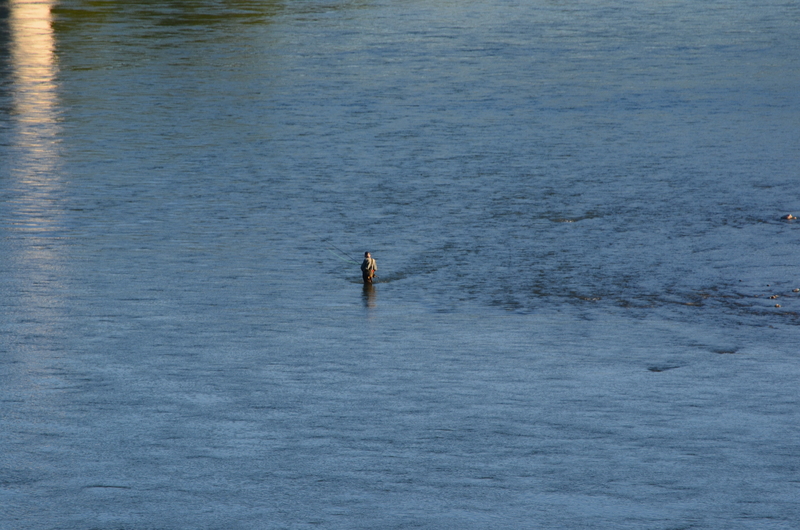 as normal scene… a man fishing at Skeena River. 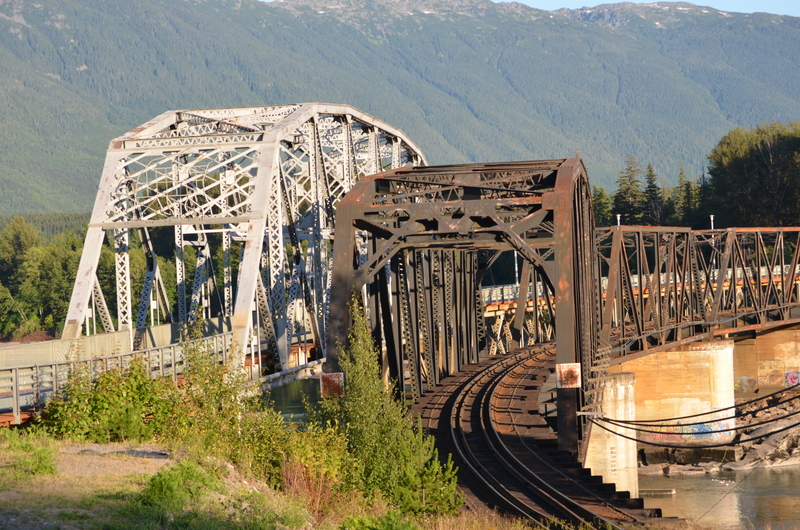 The crossing track (left) for car across the Skeena River. 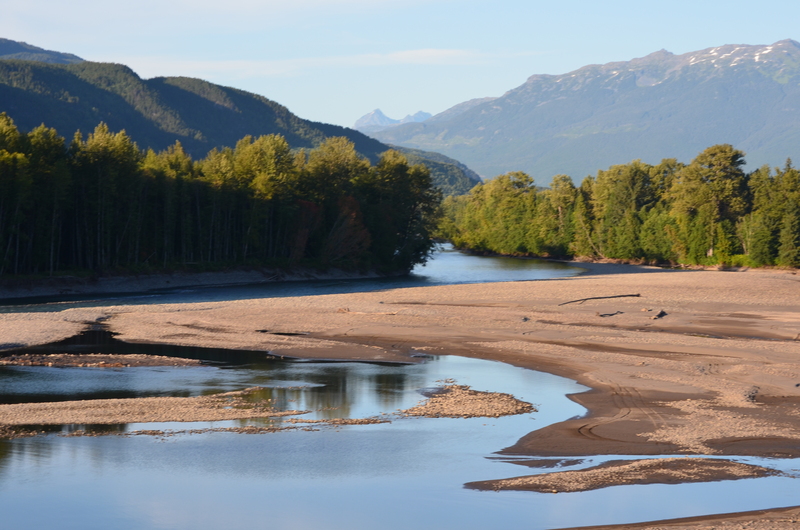 As a normal Scene a man fishing at Skeena River. 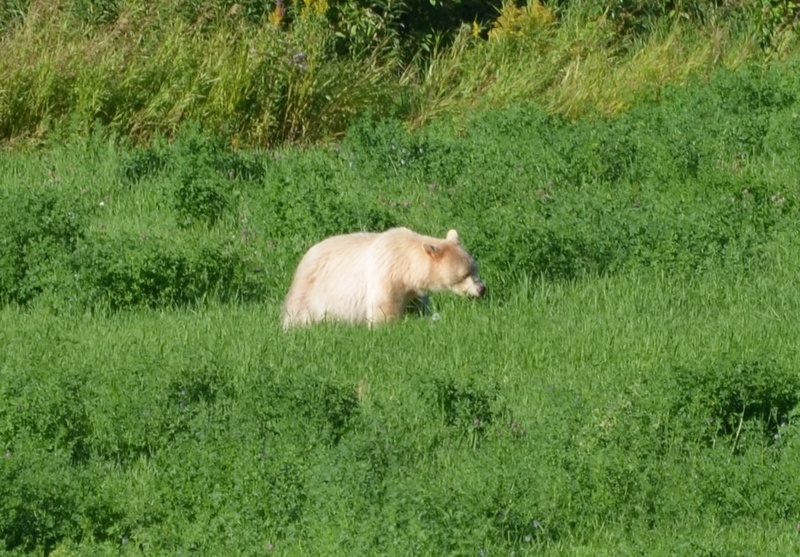 Skeena River is the main river of salmon and also the source of food for Kermode bear. Amazing you saw a spirit bear! What a special moment. A blessing. Thank you for visiting my blog. I guess you found the posts about the places you’d like to go when the boat is ready. What an exciting adventure awaiting you. When do you think you’ll go? You certainly live in a beautiful place. We lived in Vancouver for many years so know the Pacific North West – a lovely part of the world. 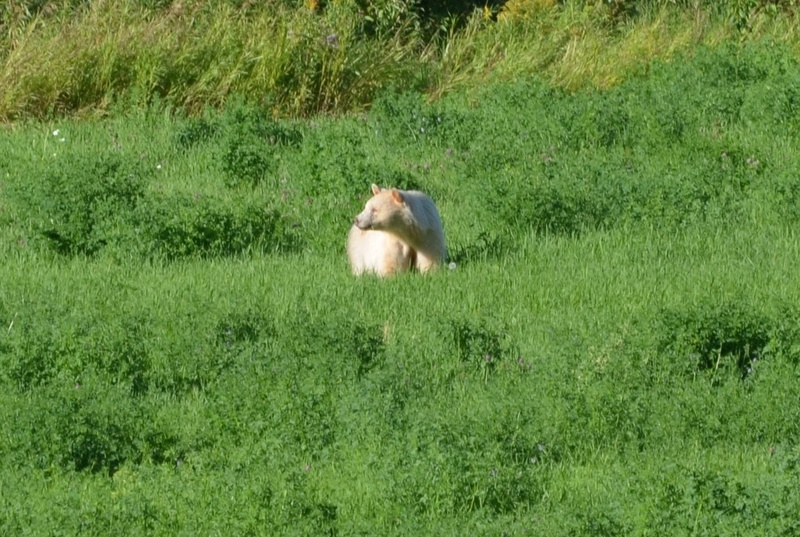 But we’ve never seen a spirit bear!